School-aged children can help plan, shop for, and pack their school lunches and snacks. The more involved they are, the more likely children are to eat their food. Pack your own lunch at the same time so your child can learn from you. Let them pick two servings of fruit or vegetables in their lunch every day. Cut fruit and vegetables up to make them more appealing. Pack a small container of “dipping sauce” such as vanilla yogurt for fruit or salad dressing for vegetables. Fruit sauces and fruit cups without added sugar are another good option. Try different types of breads for sandwiches. Let your child pick out small whole grain bagels, pita pockets, tortilla wraps, or buns. Experiment with sandwich fillings – use leftover meat from last night’s supper, canned fish, or cheese and cucumber in sandwiches. Homemade pizzas on whole grain bagels or English muffins are always a hit. Let your child pick out a fun thermos, and pack it with leftovers such as chicken drumsticks, homemade stew and chili, pasta or stirfry. Although they are handy, many pre-packaged foods are high in salt, sugar, refined flours, and artery-clogging fats, while lacking in nutrients. These convenience foods are often more expensive than home-prepared foods, and the packaging ends up in landfill sites. Be careful of the marketing – many pre-packaged snack foods have packaging that makes them look healthy (think pictures of fruit, or words like “fruit flavoured”). Look again – many of these foods have little if any fruit and are nothing more than fruit-flavoured candy. Many granola bars are chocolate bars in disguise. One-hundred-calorie snack packs are a great way to portion food, but they aren’t always healthy choices. Buy some healthy snacks and package them yourself into small snack bags or containers. Steer clear of things like cookies-and-dip snacks, which are loaded with sugar and artery-clogging fats. Make your own snack packs. Pick up a compartmentalized container and pack some cheese, lean meat, or a boiled egg, along with whole grain crackers or pita cut into triangles; add cut-up fruit or vegetables. Include milk and a bottle of water. It’s okay to include a small amount of 100% fruit juice – aim for no more than one cup per day. Avoid regularly offering sugary drinks or artificially-sweetened beverages such as pop, fruit drinks, sports and energy drinks. Include cut up fruit or vegetables for snacks, whole grain crackers with cheese, milk, half of a sandwich (try the peanut-free soy nut butters), cottage cheese and fruit, homemade muffins or fruit loafs. It’s okay to include a small treat once in a while, as long as most of their food is healthy. 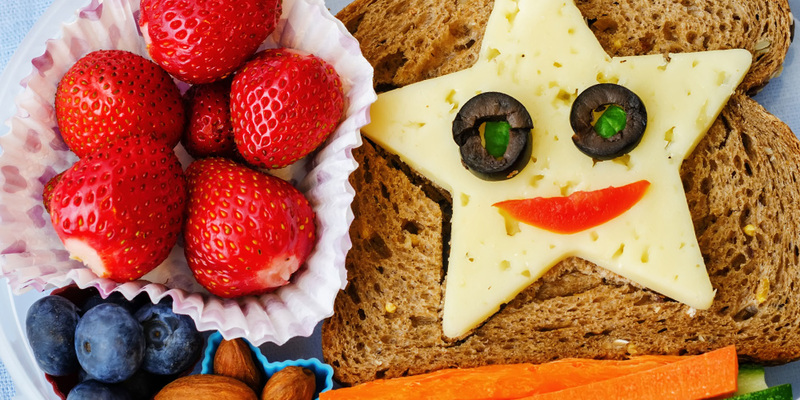 For younger children with smaller appetites, or limited time to eat, pack small portions of cut-up foods that are easy for them to eat. Find more ideas at Eat Right Ontario www.ontario.ca/EatRight. Have a healthy school year!